The former Associate Publisher of the Richfield Springs Mercury has been mighty busy since the paper closed its doors last April. Expanding his involvement with the annual Carp tournament in Baldwinsville, he and Sean Sauda partnered up to open Wild Carp Companies, of Baldwinsville, NY. Carp fishing brought Baldwinsville a bit of a claim to fame recently, when Ripley’s Believe it or Not acknowledged the tournament’s success over its first four years of inception. “In the first four years of this 50-hour endurance competition, a total of over 100,000 pounds of carp have been caught and released by our competitors, a feat matched by no other carp tournament on the planet. We were even recognized with a comic strip in Ripley’s Believe it or Not. How could we not continue on that success when Baldwinsville has positioned itself as a premiere carp angling venue in the United States?” Bernhardt asked. With that thought, Bernhardt and Sauda set their sites on bigger and better fish by capitalizing on the sport which has been a top favorite pastime for both men in recent years. Bernhardt, credited with bringing the annual CARP Tournament Series Northeast Regional tournament to Baldwinsville, has served as a volunteer on the host committee since 2006. Sauda is a lifelong resident of Baldwinsville and has been fishing the annual May tournament since 2008. After learning that the tournament was going to begin touring, “Sean and I took that as an opportunity to continue the tournament’s success in Baldwinsville,” Bernhardt said of he and his co-partner’s decision to become business partners. So what exactly is Wild Carp Companies’ goal? According to Bernhardt, the company’s focus is to promote catch and release carp angling via educational demonstrations; provide angling lessons; promote tourism; host fish-ins, tournaments and the Wild Carp Club. Since opening in June, 2010, the company currently operates out of Bernhardt’s Baldwinsville home. In addition to Sauda, the Wild Carp team also includes three pro staff anglers, Sean Lehrer, Paul Russell and Darryl Storie. Since they could not survive on just tournaments alone, Bernhardt said the company is in the process of developing a web presence and “will be offering e-commerce on our web site soon. This will include specialized carp bait and tackle (with a focus on supplying all-in start-up kits for new carpers).” They are also hosting carp angling demonstrations for schools and municipalities and will be starting a formal guide service. Citing that the carp fishing industry annually brings in more than $5.5 billion in the UK alone, Bernhardt said he and Sauda’s long term goal is to promote carp fishing as a sustainable industry and attract tourists from around the world who are visiting the United States. “We’re trying to bring carp into the mainstream, much like Ray Scott did with bass when he started Bassmasters 1968,” Bernhardt said, also noting they have a volunteer program. In June his company did a demonstration for a Syracuse based high school and in May they hosted a fundraiser tournament during which they raised $700 in a single day for Advanced Strategies Adventures (ASA). ASA is a charity that hosts hunting and fishing expeditions for disabled people. 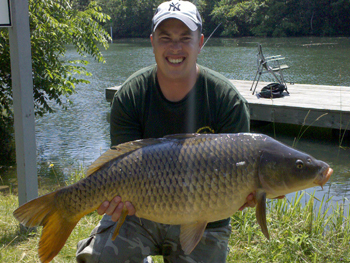 Wild Carp Companies can be found on the web at www.wildcarpcompanies.com and on Facebook by searching Wild Carp Companies.